SCTEVT Time Table 2019: State Council of Technical Education and Vocational Training (SCTEVT), Odisha has to be released the Diploma examinations Summer time table May 2019 for 1st, 2nd, 3d, 4th, 5th, 6th Sem. 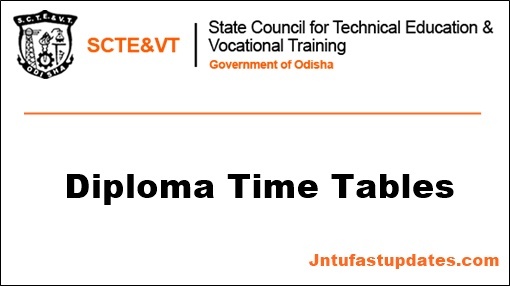 Students seeking education from SCTEVT can download diploma time table 2019 from the official website, sctevtodisha.nic.in. Students undergoing diploma in SCTEVET can check the Diploma time table for all semesters 1st, 2nd, 3rd, 4th, 5th, and 6th. The board has also released the practical examination time table as well. Students who are keenly waiting to check the SCTEVT Diploma examination dates, practical examination time table 2019 can go through this article to know more information about the examinations. State Council of Technical Education and Vocational Training (SCTEVT) is the state level technical education board established by Government of Odisha. It offers affiliation to various technical colleges across the Odisha state. The board offers diploma, ITI and various other technical courses for the students. Annually a huge number of students are coming out of this board with certification. Many of the Government/private/aided colleges in the state of Odisha are affiliated with this board. All the colleges follow the same curriculum implemented by SCTEVT. The board is going to organize the Diploma examinations in April/May months. For these examinations, the board has already released the date sheet/time table hence students can hurry up to check the details from the SCTEVT Time Table 2018 from the official portal, sctevtodisha.nic.in. The Board has released the time table for Engineering and Diploma all branches and part-time /full-time courses. The organization has released the Engineering date sheet for various branches such as Aeronautical Engineering, Bio-Technology, Mechanical Engineering (Part-Time), Electrical Engineering (Part-Time), Electrical & Mechanical Engineering, Diploma In Mechanical Engineering, Food Technology, Diploma In Medical Laboratory Technology (Dmlt), Modern Office Management, Part Time Mining Engineering, Hmct, Mechanical(Production), Mechanical(Maintenance), Electrical & Electronics Engineering, Cinematography, Sound & Tv Engineering, Film &Video Editing. Examination Programme NEW COURSE (Theory) of 1st Semester 2019(Summer) Examination. Examination Programme NEW COURSE(Theory) of 3rd Semester 2019(Summer) Examination. EXAMINATION PROGRAMME FOR 5TH SEMESTER NEW COURSE SUBJECT WISE/ BRANCH WISE/DATE WISE for 2019 SUMMER EXAMINATION. And also Diploma examination time tables for all semesters. The board has also released the time table for Architecture Assistance (A.A.), Beauty Culture, Modern Office Management (Mom), Hotel Management & Catering Technology(Hmct), Cinematography, Sound Tv Engg. And Film & Video Editing and other courses. Candidates pursuing under the board can check the date sheet from the following attachment. Download Diploma/Degree/Engineering Exam date sheet 2019 by clicking on the corresponding link.